Air Intake and Fuel Systems. Fuel Injection & Throttle Body. Turbos Super Chargers & Intercoolers. 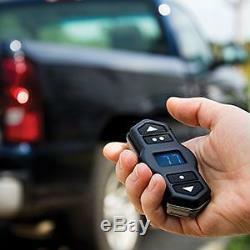 Alarms Remote Car Starters Key. Masters Calipers Lines & Wheel. Bug Deflectors & Window Visors. Hood & Bug Deflectors & Shield. Side Window Deflectors & Visor. Performance Control & Engine Management. Spark Plugs Coil & Ignition. Engine Blocks & Cylinder Heads. Engine Hardware & Headbolt Set. Fan Timing & Accessory Belts. Mud Flaps & Splash Guards. Spoilers Wings & Body Styling. For your ATV or UTV. Skid Plates & Rock Rails. Sissy Bars & Back Rests. Air & Fuel Ratio Gauges. Blenders Grills & Cooking Acce. Dashes Covers Caps & Trim. Door Handles Panels & Armrests. Floor Mats & Cargo Mats. Seats Seat Belts & Hardware. Steering Wheels Covers & Acces. Windows & Door Locks Accessory. Jeep Tops & Convertible Tops. Fog Lights and Driving Lights. Light Bulbs and Headlight Bulb. Taillights Brake & Backup Lights. Turn Signal Lights & Flashers. Nerf Bars & Running Boards. Step Rails & Nerf Bars. Strut Bars & Suspension Braces. Sway Bars & Anti-Sway Bars. Tonneau Covers & Bed Covers. CV Joints Shafts & Boots. Transmission Pans & Oil Cooler. Tire Valves Stems & Caps. Trim Rings & Center Caps. Wheel Locks & Lug Nuts. 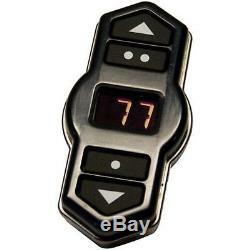 Air Lift WirelessONE Control System 25870. Air Lift Air Suspension Compressor. AIR LIFT WIRELESS ONE ON-BOARD AIR COMPRESSOR SYSTEM. Economically priced, wireless control of your air springs. One touch wireless inflation and deflation of air springs, from inside or outside of the vehicle. Easy to installno lines or wires to the cab. 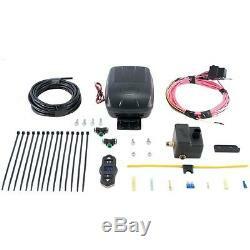 Includes standard duty compressor, manifold and wireless remote. Inflate 2 air springs to equal pressures. 3 user defined memory buttons allow for frequently used settings. 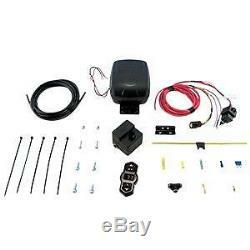 Improve your air suspension's performance with this top of the line control system from Air Lift Wireless ONE series. These air suspension units are specially designed to offer wireless control to your air springs with the use of digital key fobs. This allows you to either inflate or deflate your vehicle's air springs - from inside or outside your vehicle -with just the touch of a button. Standard Duty Compressor, Wireless Remote, Wireless Manifold, Hose Line, Wiring Harness, Fittings, Hardware. Single path On Board system. Brand New in the Box - Fit and Quality Guaranteed! You will only have to checkout and pay once for your entire order. It takes 1 to 3 days to process your order and get it on its way. The package spends another 3 to 10 days in transit - and that depends on where you live relative to our warehouse location. Some of the other carriers we use include. Please note that we are not responsible for labor expenses, towing expenses, additional repair expenses, rental car expenses or other related expenses caused by the duration of time required for you to receive the part(s) you won / ordered, or caused by any of the listed problems and any additional time required to fix them, or caused by the use of wrong, broken or defective part(s) during and/or after installation. All we ask is that you send the items back to us in the original packaging, and make sure that the merchandise is in the same condition. Return With JCWhitney - It's Easy. Products must be in the condition you received them and in the original box and/or packaging. The item "Air Lift WirelessONE Control System 25870" is in sale since Tuesday, September 16, 2014. This item is in the category "eBay Motors\Parts & Accessories\Car & Truck Parts\Suspension & Steering\Shocks & Struts". The seller is "jcwhitney" and is located in La Salle, Illinois. This item can be shipped to United States, to Canada.